It will be interesting to see if they change their minds when Slacker hammers start rolling over every inch of the server. Regardless this game can be played any number of ways and it is their choice. But I think most of us would agree that if they want a shot at "winning" in the sense of building a WW to 100, they need to at least weaken Slackers. BB your fail logic is fail. Put Your s3 IGN in your siggy. Otherwise you are irrelevant. No my reply to the screenshots. I am not denying they are real. I put the reason for it out there. Was your only attempt here to just put the polls out in the open? Ask em about it and I will tell you whatever you need to know. We see the strong team that is slackerz and want to do something to give them a run for the NE. Is no big. 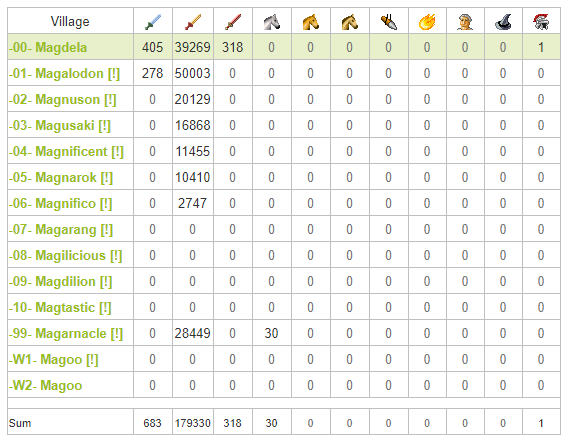 I am not saying congrats to slackerz for an easy win yet, we will see what comes. It is Thucydides for those interested. Oh yeah. I forgot you were my PD. "No my reply to the screenshots. I am not denying they are real. I put the reason for it out there. Was your only attempt here to just put the polls out in the open? Ask em about it and I will tell you whatever you need to know. We see the strong team that is slackerz and want to do something to give them a run for the NE. Is no big. I am not saying congrats to slackerz for an easy win yet, we will see what comes." Ah, motive? 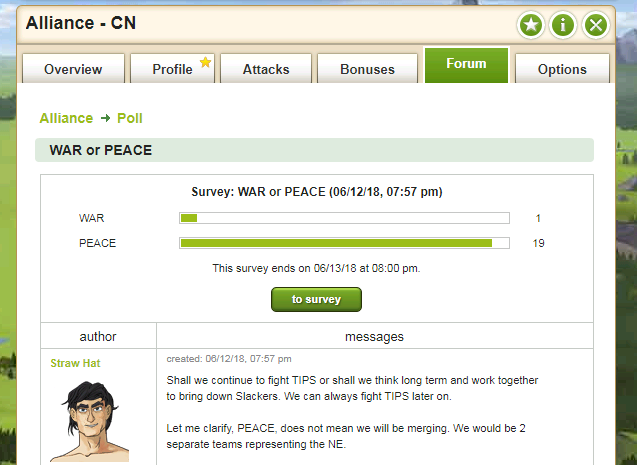 I'm posting them in the open to show the differences between members of TIPS vs CN. 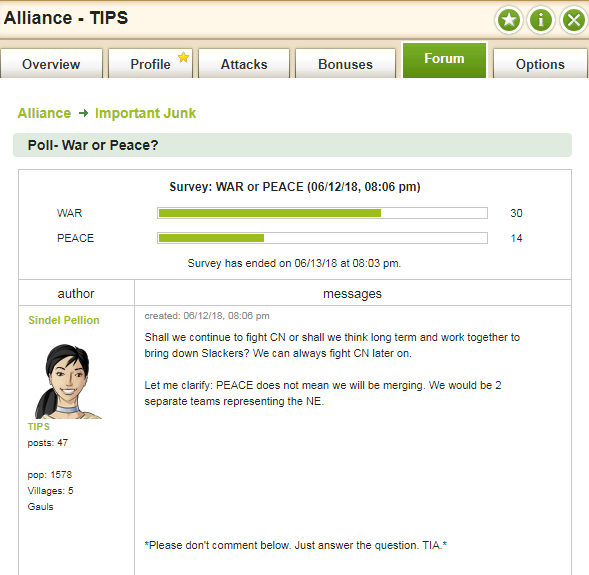 TIPS, wanting to continue war, must be more confident that they can win. 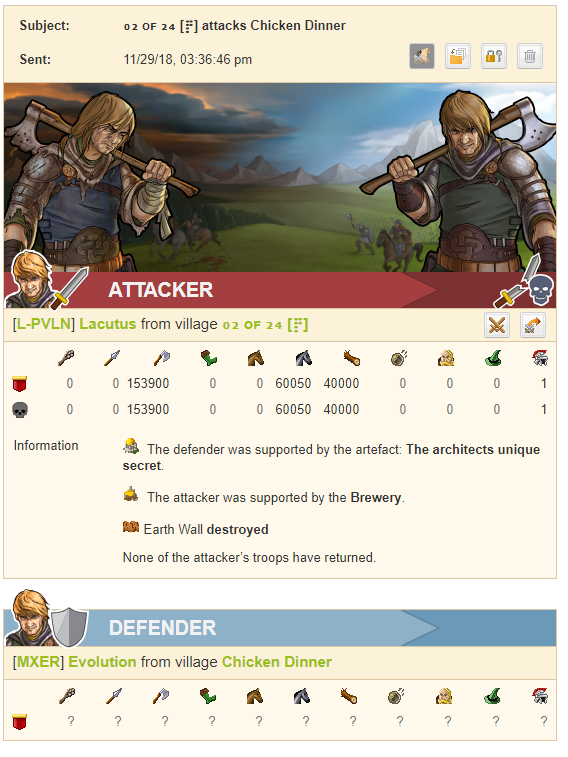 Their alliance culture might include team spirit or bloodlust. 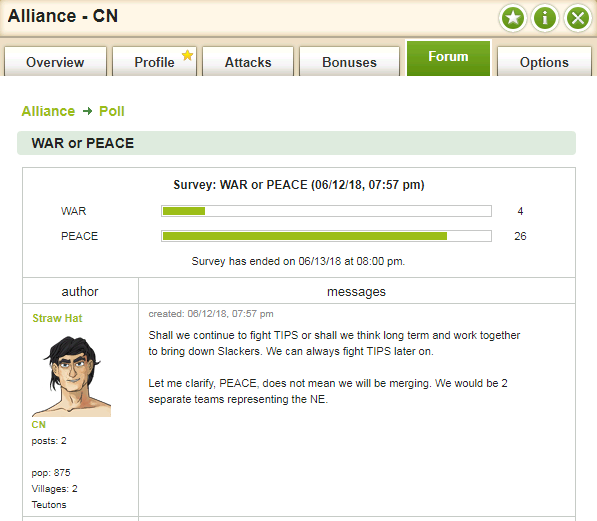 CN, wanting to find peace, must be growing weary of battle or running low on supplies. Their culture might be... weak and lack leadership. If this were a decision only among leaderships, the outcome would only be a result of individual personalities. However, being an accumulation of dozens of votes, we can see that the members of each alliance have different attitudes - possibly caused by the conditions their alliances are in. Post was edited 1 time, last by Gibby ( Jun 13th 2018 ). 6 hours in, 18 hours technically left. Request updates from your only live (not fake) news coverage on this game-changing forum poll by DMing Gibby's Discord! Hey man, thanks. If you wanna provide a more material kind of support than kind words, maybe send your material support the way of this server's most genteel class of villains? Petition to refer to the Slackers as the Galactic Empire. Well if you take Kels at his word, then CN's just taking a gander down southwards and seeing the juggernaut Delusion's got going on down there and thinking, "hey man, someone better do something about that." Now see, if it were a team that truly took individuals' liberties into consideration, then your "democratic" vote would be less "mob rule" and more "electoral college" so that the votes of those in outlying districts have their voices counted as well.. But hey, im just trolling a bit since this entire thread is going to be short lived as politics aren't allowed on the forum..
... but I was trolling the urine out of them. Me?? Ohh, i'm just here to hug everyone..
Ohh, i'm just here to hug everyone.. So you will hug me? And maybe Del needs a hug from some one to make his day better. But I am not volunteering you here since well I know he isn't your type. That is never in question.. You, my dear, get a perma-hug ! Says the one who accused her, among others, of gross misconduct with gummy worms. Hrmph. Not even huggling us. You say that as if it's a bad thing..? How does it feel to have your "big scoop" fall flat on its face Gibster? Sorry, no one cares. Hope you have a nice day though.